I am delighted to announce the exhibition “Fantasy Mode to Order” by Hiroyuki Matsukage and Kosuke Tsumura from 6th June 2007. Matsukage, whose grand installation “STAR” and performance “ECHO” both showed at Singapore Biennale in 2006 have been highly acclaimed, also continuously present a series of photograph of women which entitled “The portrait of the beauty”. For this exhibition, it has been 3 years since his last solo show at Mizuma Art Gallery, he reconfigures the series of photographs taken in collaboration with the fashion designer Kosuke Tsumura, for a quarterly magazine “Art iT”, into installation. Series of “Fantasy Mode to Order by Kosuke Tsumura” started on quarterly magazine “ART iT” which is the first bilingual art magazine in Japan. The project was launched with the editorial staff who attempts to create pages to pursue pure artistic expression without a　thread of advertisement. Tsumura liked their intension and joined in the project. Instead of being a fashion designer who creates clothes to match new trend and fit into the system of mass consumption, he suggested to create the clothes exclusively to women who appeared in his mind. Based on the imagination, he selects the model. Having presentation and discussions with the models, he expands imagination and the fantasy more and creates a dress just for the model, that is “Fantasy mode to order”. Then here Hiroyuki Matsukage, who takes all the photographs, comes and plays key role in this series. “Matsukage’s influence gradually increased and it became a part of my fantasy” Tsumura said. Matsukage, although his photograph seems those of standard at a glance, captures a woman as an icon with unique viewpoint and eroticism deepen and intensify Tsumuraﾕs imagination. The series of 9 projects started from Sayoko Yamaguchi, and then those who from various field such as Hitomi Kanehara (novelist), Fuyuko Matsui (artist), Masako Yasumoto (dancer), followed. The main pieces for show “Fantasy Mode to Order” is portraits of the women who are dressed in the fantasy, and it accompanied with actual dresses they wore. Those pieces are placed to create installation. It showed the result of expanded fantasy of both Tsumura and Matsukage for the past three years. 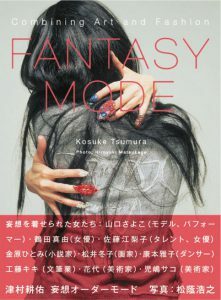 The book “Fantasy Mode to Order” will be released in conjunction with the exhibition, also artist talk and events will take place.